The doorway of No. 430 (left) was seamlessly converted to a window when the two houses were internally combined in 1993. In 1828 Edward Giraud purchased the two three-story brick houses at Nos. 152 and 154 William Street, build in 1816, on the southeast corner of Ann Street. The 38-year old merchant and his wife had a newborn son, Edward, Jr. Another son, Pierre, was born on November 28, 1833, and Henry in 1838. Pierre would develop wanderlust and in 1849, at just 16, he left home to enter the mercantile marine service. By then the downtown neighborhood had become commercial. 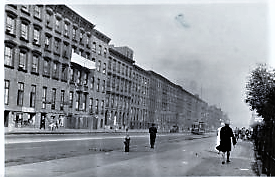 While Giraud retained possession of the Federal-style houses, Edward Jr. moved to the newly-developing Chelsea district with his wife, the former Mary Wilder. By 1855 the couple was living at No. 96 West 26th Street. That same year William B. Smith built three Anglo-Italianate homes at Nos. 428 to 432 West 23rd Street. Just 16-feet and two bays wide, their modern design placed the entrance nearly at ground level. The bold rustication of the bases was interrupted by arched openings with highly-unusual carved keystones. The segmental-arched windows of the second and third floors were capped with handsome carved lintels supported by scrolled brackets. A single cornice unified the project. Interestingly, Smith's architect distinguished the middle house by designing the third floor windows just a few inches longer than those of its neighbors. Tragedy struck the Giraud family in 1855. Edward Jr.'s wife was described by her physician as "naturally of a very nervous temperament." Early that year she began acting in what was deemed "a singular manner." It culminated on Saturday afternoon, March 24 when the 27-year old told her servant girl that she was going to Hoboken and would return that evening. Instead, Mary went to her bedroom and sliced her neck with a razor. Edward returned home around 9:00 and, as described in The New York Times, "was horror-stricken with the sight of his wife lying on the floor a corpse, with a razor beside her." Before long Edward would move to No. 432 West 23rd Street with his parents. Henry, too, was having problems. Like his brother, Pierre, he had left home for a life on the seas. He was working as a cabin boy on the clipper ship Ariel in August 1855 when its captain, W. H. Eayres, was found murdered. His head had been smashed in with a hammer or axe. Just before the body was discovered several shipmates had noticed that Giraud vomited, was ashen and sickly. It was at first simply dismissed as sea sickness. An investigation revealed that it Giraud was apparently the last to see the captain alive. Now shipmates wondered if his nausea was, instead, caused by the gruesome murder. On September 10 The New York Times reported that a Coroner's Jury decided that the first mate, Nicholas Wheaton Lakeman was most likely the murderer and "that Henry Giraud, a boy on board the said vessel, and that George Anderson, another boy on the said vessel, were also concerned in the perpetration of the said deed." Close inspection reveals that the third story windows of the middle house are slightly longer that those on either side. In the end Henry was cleared. In the meantime, Pierre had been working his way up in the merchant marines. In 1860 he was made captain of the steamer Saratoga. Then the following year, after the outbreak of civil war, he was appointed acting master of the Union iron-clad Montauk. Pierre was second in command of the vessel when it blew up the Confederate privateer the Nashville. The New York Times reported "His conduct in this action and his bravery during the subsequent attack upon Fort McAllister first brought him into prominent notice." Privately, Pierre was less impressed with the action than his superiors. He wrote a letter to his parents in February 1863 in which he said the skirmish with the CSS Nashville "was handled badly," and blamed his commander, Captain Worden, saying he was "pleasant" but "excitable." He was less harsh on himself. In describing the attack on Fort McAllister, he said he had worked the guns and "made some splendid shots." Pierre Giraud's military career continued to soar. Piloting the Ossipee into the bay of Mobile, he "engaged in another brilliant action against the Confederate iron-clad Tennessee, and after its capture was personally deputed by Admiral Farragut to receive the sword of Admiral Buchanan, the wounded commander of the Confederate fleet," according to The Times later. Whether by coincidence or not, when Pierre was made captain of the United States flagship the Tennessee, Henry Giraud was on board as Acting Master's Mate. By the end of the war Giraud was highly respected for his skill and bravery. Now a Lieutenant Commander, he sailed the steamer Onward to Japan. The New York Herald reported that he was "one of the few survivors of that vessel, when she was run into by a British steamer commanded by Captain Eyre and sun off Hong Kong." Upon his return to New York in 1869 he retired from the Navy and took command of the school ship the United States Mercury. Pierre joined his family in the 23rd Street house. The reunion of Pierre with his brother would not be long-lasting. On June 24, 1873 Edward Jr. died in the house at the age of 44. His funeral was held there two days later. On April 1, 1875 Pierre fell ill. Three days later he died of what The New York Herald reported was "enlargement of the heart." For the second time in as many years a funeral was held in the drawing room of No. 432. It would not be the last. It appears that Henry immediately leased No. 432. In April 1876 a resident advertised for sale a "No. 3 wood frame sash and moulding machine, and tools, moulding irons, &c." And in March 1878 "T.L." was looking for "A Gordon pressman who is a licensed engineer." On December 24, 1895 Henry Giraud sold the house to Frances J. Cushman for $14,250--in the neighborhood of $420,000 today. She was the wife of developer Joseph Cushman, whose family had owned and developed properties in the Chelsea district since the 1830s. Leasing the house at the time was John Glass, Jr., the president of the John Glass Jr. Construction Co. Like the Cushman family, he was involved in real estate improvement in the area. In July 1897, for instance, he hired architect G. A. Schellenger to do $85,000 worth of alterations to a building stretching between 17th and 18th Street, just west of Seventh Avenue. Following the expiration of Glass's lease the Cushman family moved in. Joseph Wood Cushman was 30 years old when he married Frances J. Rathbone in 1893. Their son, Holbrook, was born the year they purchased the 23rd Street house. The Cushmans had another son, Don Alonzo in November 1898. He was named after Joseph's grandfather who had been largely responsible for turning Clement Clarke Moore's country estate, Chelsea, into a residential neighborhood. Sadly, little Don Alonzo died five months later. In 1900 the Biographical Directory of the State of New York noted that Joseph was the senior member of J. W. Cushman & Co. and of Cushman & Denison. He was also president of the City Land Improvement Company. The family left West 23rd Street by 1917 when Joseph Cushman died at his 200-acre country estate in Westchester County, New York. They were living at No. 59 West 51st Street, squarely within Manhattan's mansion district. No. 432 was now home to Oliver H. Patterson, printer and stationer. In November that year he purchased the Trade Printing & Binding Company and incorporated it on January 1, 1918 as Oliver H. Patterson, Inc., with himself as president. But the fine rowhouses along the block of West 23rd Street would not remain private homes for much longer. During the Great Depression the owners were renting rooms in No. 432 and in 1937 were cited with a "multiple dwelling violation" by the Department of Buildings. One of the roomers here in 1943 was the self-taught amateur sculptor, Joseph Quattrone. Seven years earlier, during the height of the Depression, his dress business had failed and his wife walked out on him. The 38 year old had spent three nights without food and slept in the subways. He later told a reporter that he vowed at that time to build a shrine to his patron saint, St. Theresa. He lived in a room at the rear of a store for a few years until he had enough money to rent a nicer room at No. 432 West 23rd Street. All the while he collected odds and ends to build his shrine. A Catholic newspaper wrote an article about his efforts, and through that he received contributions of old buckles and pins, which he used for their rhinestones. The little money he could scrape together was used to buy small pieces of marble and gold plate. He scoured trash bins for parts of brass. As the summer of 1943 approached, Quattrone's astonishing miniature shrine was nearly complete. Standing four feet high, it weighed 200 pounds. In June the Leo House, a block away at No. 332 West 23rd Street, arranged with Quattrone to exhibit the extraordinary piece. The New York Times deemed the shrine "elaborate" and noted "There was a statue of St. Theresa in the center, behind a glass, bronze-lined door. Even the hinges on the door were hand-wrought...The dome, made of gold, silver and pewter, was ten inches high and weighted two pounds. On it were two bronze angels and a cross mounted with rhinestones." On June 14 the newspaper reported heart-wrenching news. "The dome of an elaborate shrine on which a poor man lavished all his savings and the leisure time of seven years was stolen Saturday night." The article explained "On Saturday night, he borrowed a pushcart from a friend and in it placed the shrine, in sections. He left it for a while to look around his house. When he returned the dome was gone." The house continued to operate as a rooming house for decades. By the 1970s the Chelsea district was suffering decline, a condition reflected in the tenant list. James Mahoney lived here in 1971. The 41-year old had a criminal record of five arrests and two robbery convictions. He was arrested again in June that year on first degree assault charges. Mahoney's problems went beyond his criminal career. Three times after being placed in The Tombs he was sent to Bellevue Hospital because of his erratic behavior. On August 10 he was transferred to the mental facility at Rikers Island and was held there until September 21. His Supreme Court hearing was scheduled for September 24. He would not appear. On the afternoon of the 23rd a Tombs staff psychiatrist visited him, reporting that he "appeared to be in a psychotic state, pacing back and forth in his cell and hallucinating." The psychiatrist left Mahoney and was preparing paperwork to have him transferred again to Rikers Island when only minutes later notification came that Mahoney had hanged himself by a bed sheet. The Chelsea neighborhood experienced a renaissance in the last years of the 20th century. In 1993 No. 432 was internally combined with No. 430. The entrance to the latter house was converted into a window and a total of nine upscale apartments, some of them duplexes, were created.